This week The Luxury Technology Show took over the Petersen Auto Museum in Beverly Hills (adjacent) California. A gathering of high-end products, there was a little something for everyone -- audiophile headphones, outdoor speakers and TVs, drone camera systems, watches, massage chairs, cigar humidors, you name it. Hell, BMW North America even trotted out its brand new carbon fiber hybrid, the i8 (a rolling work of art). Since this is High-Def Digest, I focused on audio and video. Here, in no particular order, are my five favorite A/V product demos (plus two insanely expensive headphones). Panasonic was on hand to demo their AX850 and AX900 series 4K Ultra HD displays even though they're still a bit mum on release dates and final pricing. These 4K displays will be THX certified, capable of 4K @ 60p, produce Full HD 1080p 3D to each eye, and come with the now-expected suite of apps and Internet streaming services. The 85-inch AX850 was getting all the looks. It's absolutely huge and the 4K footage (H.264 MPEG-4 AVC on a USB drive) looked mighty impressive, but with the edge-lit LED, the black levels weren't perfect, especially in contrasty situations like white titles on a black background (small quibbles). Then I got talking to Panasonic about the smaller, TC-65AX900U. 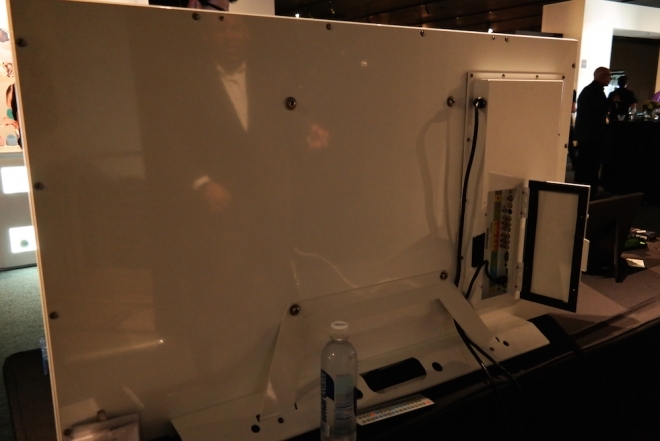 The Luxury Technology Show was this display's North American debut. Not to mince words, but the Full Array LED AX900 is simply gorgeous (Full Array LEDs are kinda like earlier gen LCDs in that they are backlit, but by LED instead of CCFL). The 4K demo material -- a collection of European locations -- was rich with detail and the dynamic range was similar to my Dolby Vision demo from earlier in the year. Initial pricing should be somewhere in the $7500-$8500 range (not official), but as those numbers drop, this model will aim to rival the discontinued VT & ZT series plasmas. Yeah, Panasonic says the black levels on this are that good, but unlike the plasma, this TV is bright enough to watch during the day. From what I saw, over the course of five minutes, I'm definitely going to keep an eye on this series as prices drop over the next couple years. For better or worse, this is Panasonic's future. SunBriteTV manufactures all-weather 1080p displays for those who have outdoor living spaces like pools or patios or barbecue pits. Sourcing most of their LED panels from LG, these sets are the opposite of the Panasonics above. No 4K. No Wi-Fi. No frills, really. Just a solid HDTV housed inside a waterproof casing built to survive outside in all the heat, rain, and winter you can throw at them for around five years. SunBrite offers two lines, the Signature Series and the Pro Series. The Signature is more affordable and can handle everything save for constant, direct sunlight. If your display lacks any source of cover or shade, you need to get the Pro Series. 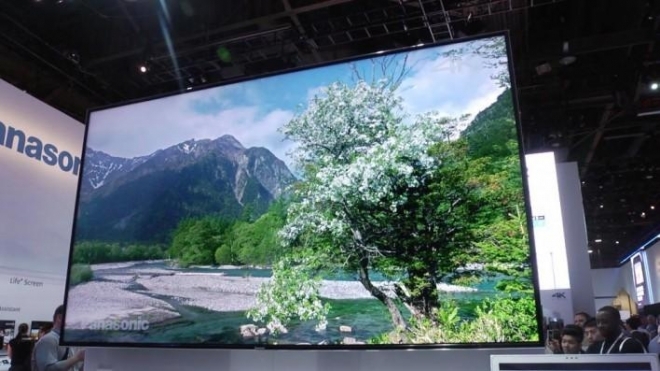 I didn't get to demo the TV with any of my own HD sources at the LTS, so I can't speak to things like color accuracy or black levels, but these TVs are really bright and the screens are designed to reduce glare. My only question was, wait, it's all good to waterproof your TV, but how does it get a signal AND stay water proof? There is a wireless transmitter you can get, but if you have to hard wire, there's a metal door on the back (pictured above) allowing for all sorts of inputs -- HDMI, USB, coax, RCA, even S-Video -- with a thick rubber gasket. You simply run your wire through the gasket, and seal it up. Here's a fun little Bluetooth speaker for those on the go. 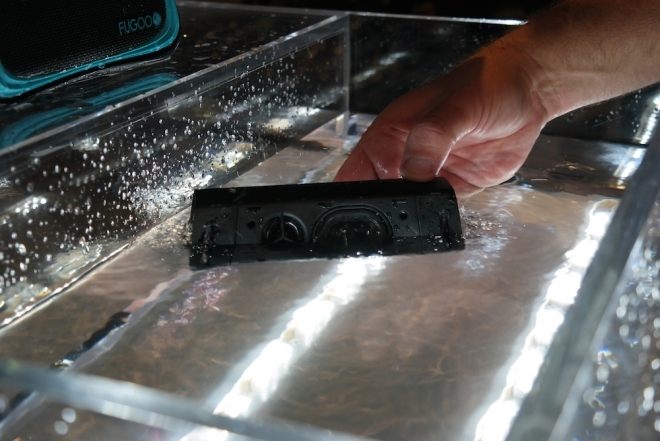 Fugoo is similar product to the Beats Pill, but is mud proof, shock proof, snow proof, and water proof. CEO Gary Elsasser was keen to prove this by dropping the Fugoo on the ground as well as dunking it in a small water tank. With a 40 hour rechargeable battery and 360-degree sound (meaning the music sounds the same from all sides), the Fugoo is available in three different "skins" -- Style and Sport models are $199, while the Tough model sells for $229. Apparently with the Tough you can drive right over the speaker and it'll survive. Fugoo has also designed accessories to mount this little Bluetooth speaker to bikes and tripods and kayaks for whatever outdoor activity you've got planned. It was a little loud to hear exactly how good these sounded, but it's definitely a fun product worth checking out. And affordable too! The OutCast is the granddaddy. At $899, you get a 20-hour battery, 360-degree sound, a backlit keypad, an 8-inch woofer, and 100W of power. It is, quite honestly, a Bose Wave Radio killer. You know how I couldn't quite hear the Fugoo demo? Blame the OutCast for producing volume and bass sans distortion. Sounds good! The OutCast Junior, at $599, is more affordable and more portable. It has a smaller 6-inch woofer, and only a 15-hour battery. Last, but not least, the $399 Melody is the newest SoundCast speaker and the first one to include built-in Bluetooth so, unlike the OutCast and OutCast Junior, you don't have to buy any accessories to stream music wirelessly. 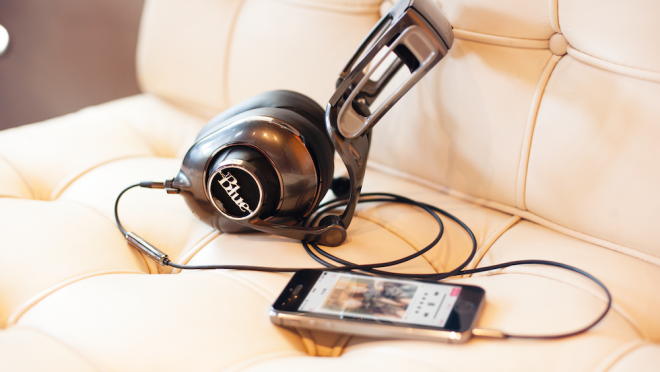 Simply pair an audio device, and you'll get CD quality audio for up to 20 hours. However, given its size, the Melody doesn't have nearly as much bass as its bigger brothers. You might have heard of professional Blue Microphones before, but the Mo-Fi is the company's first audiophile-grade headphone. They don't use any digital signal processing -- they're 100% analog -- but they do have their internal amplifiers connected directly to the driver in each ear, and cost around $350. Power comes from a rechargeable battery good for 12-14 hours of music playback in one of three settings modes. "Off" leaves the Mo-Fi in passive mode, allowing your iPhone or receiver or amp to do all the work. Flip the switch to "On" and now the Mo-Fi's internal amp comes to life in an as neutral a setting as possible. "On+" is for bass lovers, engaging "the amp’s analog low-frequency enhancement circuit to deliver incredibly deep and smooth bass." Listening to Nirvana's In Bloom, the Mo-Fi headphones were detailed accurate and capable of going very loud without any sense of distortion. I enjoyed my quick demo very much. On my way out the door, I stopped for one more headphone demo. Despite the fact that Ultrasone headphones sound absolutely amazing, there's no way I'm ever going to drop almost two thousand dollars (let alone a full five) on a pair. That said, if you have this kinda cash lying around gathering dust, give it to me (zing!). 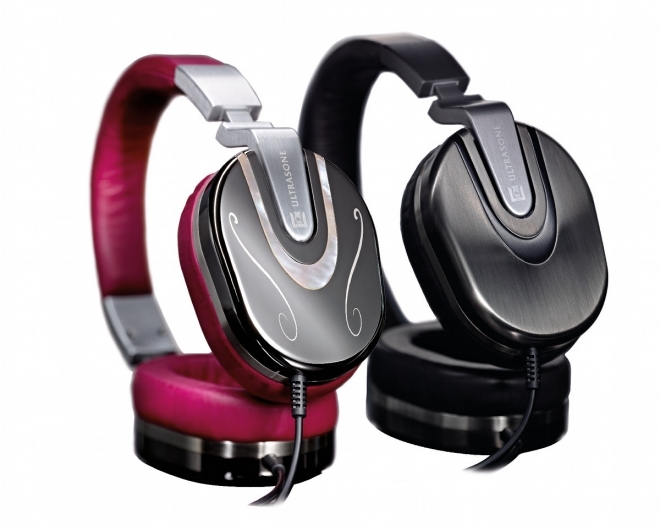 If that's not an option, pick up a pair of Ultrasone Editon 8 Romeo headphones. Why? Ultrasone has this patented technology called "S-Logic" Natural Surround Sound. Like the Mo-Fi, there is no digital trickery here. Where conventional headphones place drivers directly over, on, or in ears, the S-logic system (it looks kinda like a mounting bracket for a miniature car speaker) "decentralizes" the driver position, putting it behind the ear and allowing the sound to "reflect off the surface of the outer ear directions before entering the ear canal." The result is an incredibly wide and enveloping soundstage, a feeling of listening to high-end studio monitors in a recording studio. Dolby Headphone or DTS Headphone:X digital processing technologies can reproduce this to a degree, but not really. I've never quite heard stereo music like this before -- I just wish the listening environment had been a little quieter. CD-quality sound off 'The Dark Knight Rises' soundtrack was pretty good, but when I switched to 24-bit/44.1K FLAC files of Bon Jovi's I'm With You and Led Zeppelin's Misty Mountain Hop, I was just blown away. I also heard Ultrasone's flagship Edition 5 headphones. They cost upwards of $5,000, sound pretty great too, and are nicely appointed with luxury materials. But they certainly aren't $3,200 better than the Edition 8s. Then again, I'm not in the market for either set. I'll show my self back to the other side of the railroad tracks.